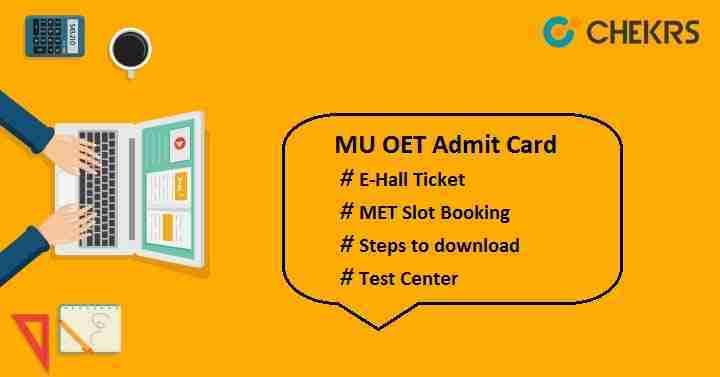 MU OET Admit Card 2019: Candidates who have filled MU OET Application Form and submitted it befor the last date can download the Manipal University Admit Card from the official website. It will be available through online mode only. It will be not sent to any candidates visa post, only admit card mail will be sent to you regarding the admit card. MU OET 2019 Hall Ticket is very important document to be carried by the candidates as it contain the information about the candidates and exam also. Only those candidates will be able to get their admit card who will book their exam slot. Check the Manipal University Admit Card 2019 Date along with the exam schedule. Candidates who will submit their filled-up application form before the last date, can book the exam slot to get an admit card. Within 24 hours after booking the exam slot, candidates will be able to get their admit card. See the simple steps provided here to book the exam slot. Visit this link manipalotbs.com to book the online test schedule. Enter the application no & online test booking password and submit it. Select the test centers, date & time as per your choices. After booking the exam slot, candidates will be able to download the admit card. To get the Manipal Entrance Exam Hall Ticket, Click Here. MU OET e-Hall Ticket will be shown on the screen. Download it and take the print of it on A4 size paper. Follow the listed below instructions while appearing for the Manipal University Entrance Test. Take 2 print-outs of downloaded admit card on A4 size only. Don not forget to bring the MU OET Admit Card while appearing for examination. No one will be permitted to appear for the entrance exam without the admit card. Check all the details printed over the admit card, in case any discrepancies you can contact to the officials of the University immediately. Keep it safe until the admission process is finished. It may be required at the time of counselling/ admission. Candidates need to bring 2 copies of the MET Hall Ticket, one photocopy of the application form and any one of the valid ID proofs: Passport/ Driving License/ Voter ID card/ PAN card or School/College photo-bearing ID card. With the help of information provided by us, candidates will be able to download the MU OET Admit Card 2019 and also book the exam slot. For any query you can contact to us by commenting in the below comment box. Best of Luck!! !